"He was a leader who was deeply rooted in his past yet possessed a colossal, illuminating vision for our collective future." Ban Ki-moon (centre-right) joins fellow Elders Gro Brundtland, Ricardo Lagos and Kofi Annan at #WalkTogether for Peace in London in October 2017. Thank you for inviting me to say a few words here today. 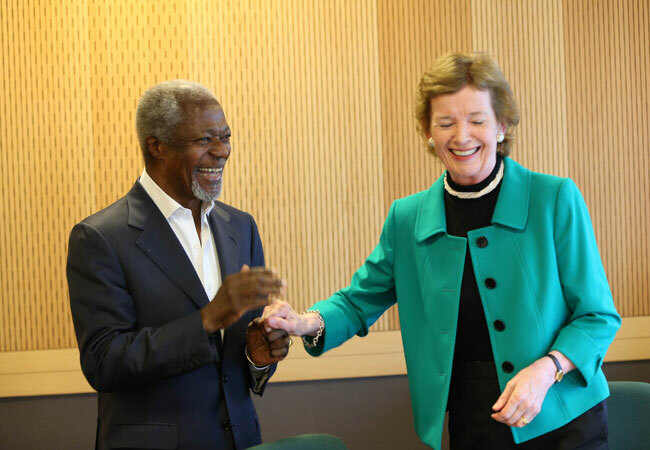 As a lifelong civil servant, as a devoted family man, as the head of the United Nations during a turbulent decade, and as my friend, I have always had tremendous respect and admiration for the late Kofi Annan. And being back here in New York, I am reminded that the entire world shares my admiration. 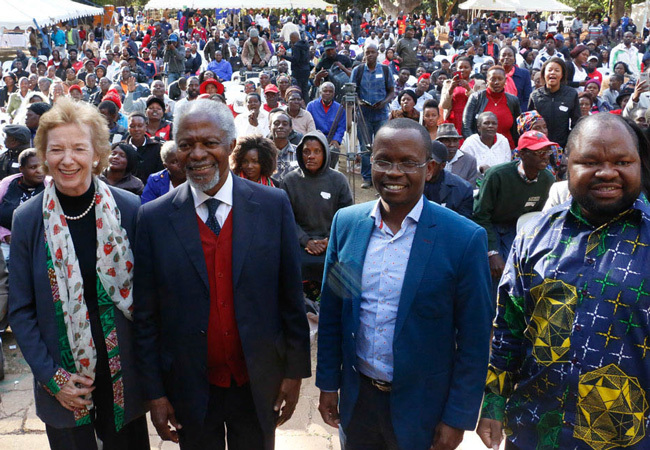 Indeed, the international community was continually astounded by Kofi Annan’s razor sharp intellect, moved by his guiding compassion, and encouraged by his driving idealism. This was just as true for world leaders and diplomats in New York and Geneva, as it was for everyday people in Kumasi, Ghana and beyond. Those of us who had the honor to know him are extremely fortunate to possess warm personal memories of such an inspiring leader, one who gave so much to this world and was a genuine force for global good. 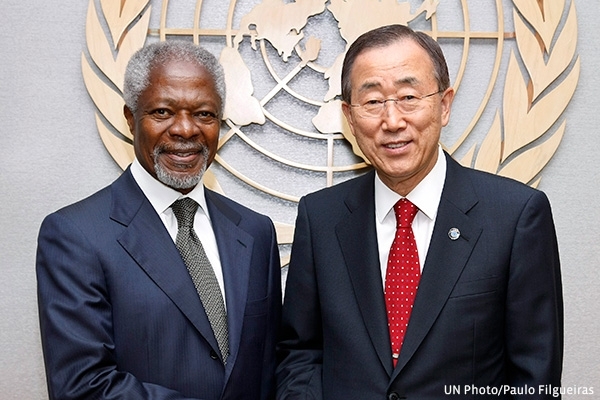 I first met Kofi Annan when I served as South Korean Foreign Minister. His support and kindness helped pave the way for the path I took in following him. As his immediate successor as UN Secretary-General, I relied on his guidance in ensuring a smooth leadership transition for the Organization. And after I took up the reigns as Secretary-General, I again humbly called on him. He accepted the impossible task of mediating the deadlocked Syria talks. He helped to prevent violence in Kenya, saving countless lives. And he served as my trusted advisor. After I concluded my tenure as Secretary-General, I was fortunate to have the chance to work with him once again as a member of The Elders, where he served as Chair. In fact, I was proud just under a year ago, to walk together with Kofi Annan, all of the Elders, and young leaders from around the world through central London to Nelson Mandela’s statue. We walked together to honor those working to build peace in the face of conflict, division and despair – A situation Kofi cared deeply for. He was a diplomat, but also a very inspirational leader. And he was always thinking of how he could inspire courageous leadership in others, so that they could go on to overcome human suffering and to right the wrongs in the world. This is what he continued to do right up until the very end of his brilliant life. I will always struggle to put into words just how much Kofi Annan helped me personally, and how well he served humanity. His commitment to peace and conflict resolution, sustainable development, human rights, and global education resonated powerfully with all those he came across, including me. But even though my tribute can never fully express the feelings in my heart, I am confident that history will show, as the years pass, that Kofi Annan was a monumental leader. He was modest yet simultaneously commanding. He was a leader who was deeply rooted in his past yet possessed a colossal, illuminating vision for our collective future. He was a leader who has left us bereaved with his passing, but has provided us with a remarkable legacy that will endure forever and continue to inspire. Arch Bishop Desmond Tutu – who Kofi Annan succeeded as Chair of The Elders - said upon his death that he always saw him as a wiser, younger brother. I saw him as a wonderful older brother who taught me so much. To his wife Nane, and his children Kojo, Ama, and Nina, my deepest condolences to you and your family. Today, in this august GA Hall, we stand together in deep morning and in heartfelt tribute to a great man who embodied the universal ideals we all strive to uphold. Kofi, may you rest in peace for all of eternity.